Bedřichov is one of the most famous sport and relaxation centers not only in the Jizera Mountains but also in the whole of the Czech Republic. Even for those who don´t want to ski and would prefer to rely on their own feet, there is a lot to see and do – a dense net of well marked tourist paths and attractive places to encounterat every step – outlook towers, dams, little monuments, original old glassworks, nature reserves... this will make your trip to the Jizera Mountains an unforgettable experience. 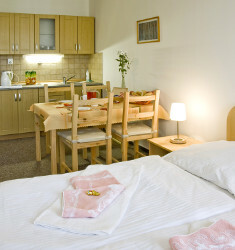 You can even rent a horse in Bedřichov! The fans of more „static“ sports will also find what they like – you can rent tennis courts, have a swim in the mountain dam Černá Nisa or in the natural open air pool. You can go out with friends to the local pub or play bowling. Simply everyone will find his cup of tea in Bedřichov, just come and see! Both in winter and in summer months, the Jizera Mountain Trail is one of the most popular trails in the Czech Republic. It is 130 km of trail used by skiers in winter and tourists and cyclists in summer. The well kept trails around Kristiánov and Bedřichov, Nová Louka and Jizerka are the most beautiful. They are enriched by lookout towers with a view of the Jizera mountains. However, the most beautiful must be considered to be the surroundings themselves. The trails lead to forest paths, past waterfalls, brooks and unique moors. The trails are kept and marked regularly. Down-hill skiers will appreciate two ski-resorts in the Bedřichov area – one in the village of Malinovka and another, just 4 km far away, on a slope called Severak over the village Hrabětice. Standard services are available for both down-hill and cross-country skiers in Bedřichov, including the ski-rental and instructors. Josef Klamt had a calvary built in the woods over Bedřichov in 1878. According to the local vicar the spring water used here had a healing effect and that´s why Klamt built a well at the spring. The calvary and the well have been visited a lot by the believers and tourists from 1903.Hašlerova chata (mountain chalet) which was first used as a lookout tower was built nearby. Stations of the Cross and an altar painting on a metal plate in one of the stone blocks were installed on the original calvary path. The Jablonec dam is situated in the centre of Jablonec nad Nisou and it was finished in 1910. It is said to be the biggest city water area in Central Europe. It is one of the most? Popular water reservoirs. Nowadays it is mostly used for recreational purposes. There are sandy and grass beaches. The entrance to the water varies – flat or steep depending on where you enter the water. There are tennis courts for beach volleyball, playgrounds, boat and paddle boat rental, a couple of children‘s play areas and concrete playgrounds for football, tennis or basketball (all free of charge), a lot of fast food stands and restaurants. It is suitable for diving, windsurfing and yachting. 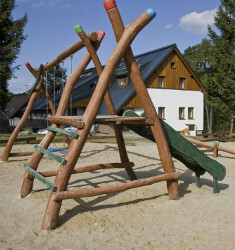 The sport facility Břízky built nearby the dam offers tennis and volleyball courts, football playgrounds, athletic ground, gym and children´s area. It is mainly known as a cross country skiing area. You will find well kept skiing trails in winter here, including a lit skiing circle trail which enables training after dark. The asphalt path is used by inline-skaters in summer. A gallery with collections of glass and metal jewellery, coins and medals. There are two permanent exhibitions – an empire state room and glass buttons from the 19. century. This late baroque house with two floors and a mansard roof is one of the oldest houses in the town. It was first mentioned in 1773. Later on there was a chemist and restaurant with accommodation Belveder. The building was elaborately reconstructed in 1998 and since then it houses a gallery and also a collection of modern glass and metal jewellery, medals and coins. 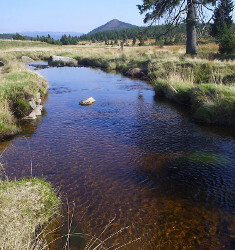 Ještěd is situated on the outskirts of the town of Liberec and it is no doubt its dominant feature. It serves as a TV transmiter, look-out tower and a four star hotel. Ještěd is used as a top ski resort during the winter months. In the winter 2009 the World ski championships were held here. The area consists of two four-seat funiculars, a cabin funicular, one two-seat funicular, five tows and 12,5 km of ski slopes of different levels. Further on, you can find a ski rental and service, ski school with its own area, fast food and a reastaurant on the ski slope. The architect of Ještěd Karel Hubáček was awarded the prestige prize from the International Architects Union – Auguste Perret prize for Ještěd as „The building of the century“.